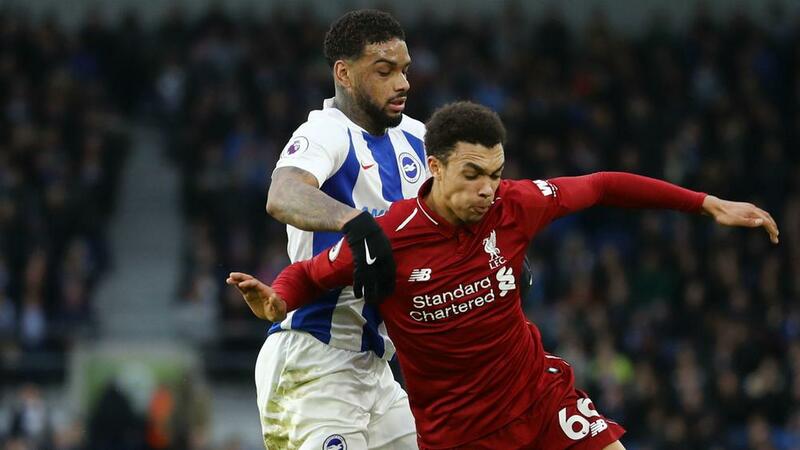 Liverpool defender Trent Alexander-Arnold could be out for up to four weeks after suffering a knee injury at Brighton and Hove Albion. The England right-back turned his ankle in the warm-up for Liverpool's 1-0 victory at the Amex Stadium last Saturday. Alexander-Arnold played with the help of strapping and painkillers, with Mohamed Salah's penalty briefly stretching Liverpool's lead at the top of the Premier League to seven points before Manchester City's 3-0 win over Wolves cut it back to four. However, he now faces at least a couple of weeks on the sidelines, though with no surgery required he could make a quicker return as Liverpool monitor his progress. The timing of the blow is particularly poor, with Joe Gomez and Joel Matip both out through injury and Nathaniel Clyne having been loaned to Bournemouth. James Milner and Fabinho may have to move to right side of defence during his absence, which - if it lasts for four weeks - will see him miss Premier League games with Crystal Palace, Leicester City, West Ham and possibly Bournemouth. Liverpool host Bayern Munich in the first leg of their Champions League last-16 tie on February 19, a fixture Alexander-Arnold should be fit for providing the timescale proves correct. Meanwhile, midfielder Georginio Wijnaldum is a doubt for Saturday's visit of Palace because of a knee problem.